Earlier this year, we announced Anypoint Runtime Fabric, which is a container service for multi-cloud deployments. Anypoint Runtime Fabric makes it easier for users to deploy Mule applications and APIs to their managed infrastructure whether it’s in their private IaaS (Microsoft Azure or AWS) or on-premises data centers. Users can flexibility deploy APIs and integrations to third-party clouds, while maintaining centralized control through MuleSoft-hosted management and development environments. What is Anypoint Runtime Fabric? 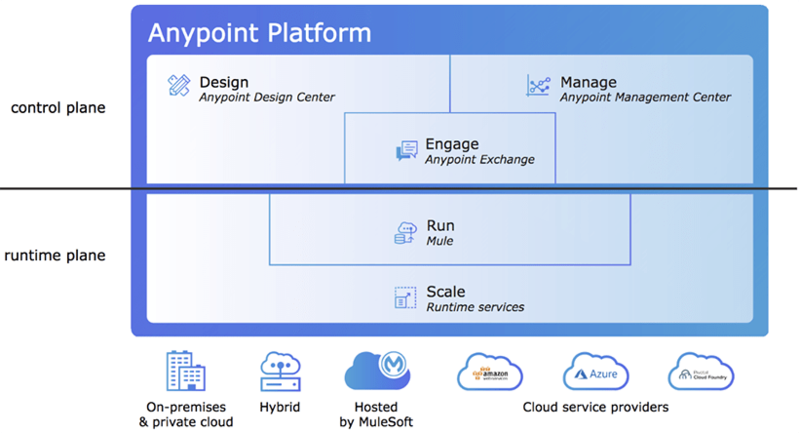 As briefly discussed above, Anypoint Runtime Fabric is a container service for multi-cloud deployments of Mule runtimes. Built on Docker and Kubernetes, Anypoint Runtime Fabric drastically simplifies the deployment and management of Mule runtimes on Microsoft Azure, Amazon Web Services (AWS), virtual machines (VMs), and physical servers. Multi-cloud support: Deploy Mule runtimes consistently across Microsoft Azure, AWS, VMs, and bare metal. Docker and Kubernetes built-in: No teams required to support or maintain orchestration and automation. Benefits of the cloud and on-premises environments: Isolate applications, deploy multiple runtime versions in the same Anypoint Runtime Fabric, scale horizontally, and redeploy with zero downtime. Unified management: Easily manage deployments in multiple clouds all from Anypoint Platform’s cloud-based control plane, hosted by MuleSoft. How is Runtime Fabric different from CloudHub? CloudHub is MuleSoft’s managed public cloud infrastructure, which includes both where the design, engagement and management elements are hosted (control plane), as well as where customers can deploy runtimes (runtime plane). With CloudHub, customers do not have to manage any infrastructure because everything is hosted and provided by MuleSoft. As a result, enterprise-grade capabilities are provided as a service, such as 99.99% uptime, one-click scalability, and automatic updates. Anypoint Runtime Fabric is for customers who have requirements to deploy their Mule runtimes of their own infrastructure – whether in their cloud or on-premises. It’s the optimal option since users can still reap the benefits of CloudHub, such as horizontal scalability and zero downtime redeployments, while keeping their runtimes on-premises. Why Anypoint Runtime Fabric instead of a do-it-yourself model? To answer the above question, let’s compare the outcome when a team uses a do-it-yourself model for deploying Mule runtimes to third-party IaaS or data centers, versus when they use Anypoint Runtime Fabric. 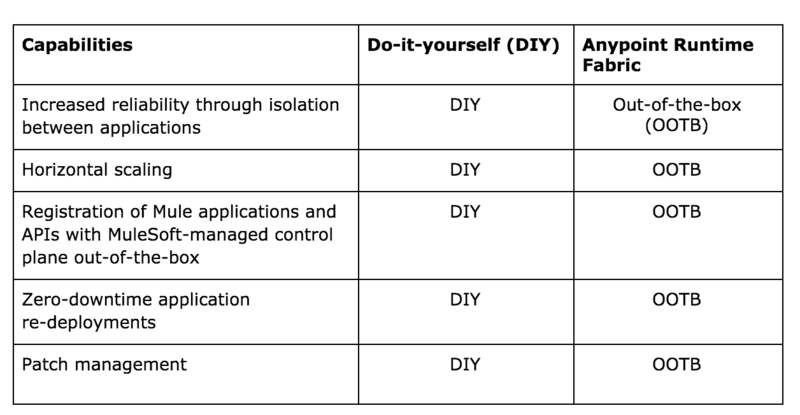 As the above table demonstrates, “doing-it-yourself” involves implementing a number of capabilities from scratch. This approach not only requires a lot of resources, but also leads to significant manual processes, higher costs, and additional man hours. On the other hand, Anypoint Runtime Fabric allows teams to implement the above capabilities much faster by simply using out-of-the-box components. In short, Anypoint Runtime Fabric bridges the gap between multiple clouds and on-premises resources, to help enterprises meet changing business requirements in a quick and efficient manner. To learn more about Anypoint Runtime Fabric, check out the documentation and join our webinar on September 19th at 9am PST. We’ll share best practices, show a demo and answer your questions live.